In volume 10 of our copy of ‘The Northern Gardener’ published in 1956, there is an article by Kenneth Lemmon, the Honorary Editor, which says of the Gott Collection in Leeds Central Library ,’I cannot think of another such collection outside the R.H.S. Lindley Library or the British Museum and the older universities.’ Whether that still applies today I cannot say but one can be sure that the collection here in Leeds is still of huge significance and a highly valuable source of research to all with an interest in the history of gardens and gardening. Beryl Katherine Gott, née Robins, born in 1866, married her cousin Frank Gott of the famous Leeds woollen industry family on the 29th June 1893. Frank Gott was Lord Mayor of Leeds, 1917-1918. Beryl, or Mrs Frank Gott, was Lady Mayoress and she also became Leeds first woman alderman and one of the first four women magistrates to be appointed to the Leeds Bench. She was extremely active in institutions connected with the life of the city of Leeds. 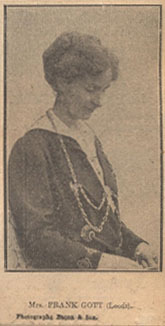 Not only was she a member of the National Union for Women Workers she was also vice-chair of the Leeds Charity Organisation, a member of the Court of the University, a member of the Yorkshire Ladies Council of Education and throughout the First World War Beryl was one of the secretaries of the Red Cross inquiry office at Becket’s Park Hospital. This was one of the first Red Cross inquiry branches to be opened outside London. Amongst her many interests and commitments Beryl had a huge passion for gardens and gardening. This, along with a number of his books, she probably inherited from her great grandfather, Benjamin Gott, the founder of the Leeds Gott woollen merchant industry. Gott’s Park in Armley is one of the family’s gifts to Leeds. 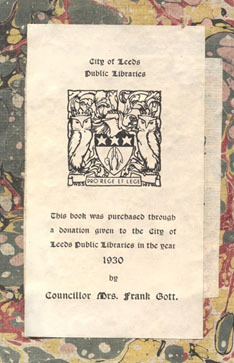 In 1930 Beryl bequeathed a gift of money to the Leeds Public Library which was used over a number of years to purchase books on Horticulture. The picture shown here is an example of a bookplate that records the fact that the book was purchased out of the donation left to us by her. These are to be found on the inside front cover of many of the books in the Gott collection. The bequest was a highly valuable asset that enabled the library to purchase many important horticultural books over the years. Beryl Gott left yet another legacy to the Leeds Public Library. On her death in 1941 she left a large part of her library to us. In all there are approximately five hundreds books in the Gott Collection. These include some one hundred and eighty four bound volumes of Curtis’s Botanical Magazine. These with few exceptions run continuously from the first volume of 1787 to volume 184 in 1983. Also hugely important are Curtis’s ‘Flora Londinensis’ or, Plates and descriptions of such plants as grow wild in the environs of London. Originally published between 1775 and 1798 and bound in six volumes. 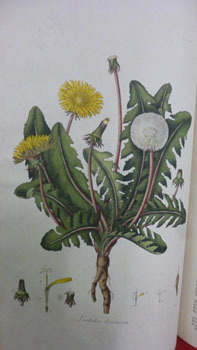 From the Flora Londinensis William Curtis makes the common dandelion or Leontodo Taraxacum seen here on the left, look quite special. 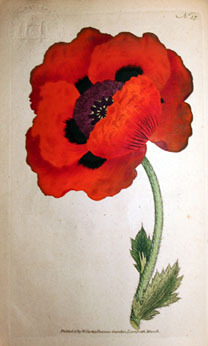 On the right, from the very first edition of Curtis’s Botanical Magazine, 1787, is his Papaver Orientale or Eastern Poppy. A flower with no small significance at this time in history as we remember all those who fell in the First World War one hundred years ago. 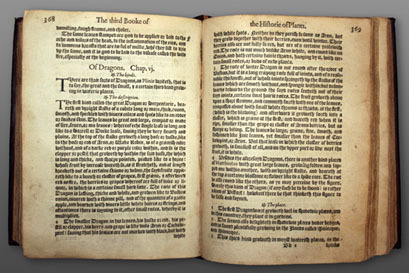 Other items in the collection of great importance include 2 copies of Dodoen’s ‘New Herball’ printed in 1586. A history of herbs and plants ‘……which are heere growing in this countrie of England…….First set foorthe in the Douch or Almaigne toong, by that learned D. Rembert Dodoens, Phisition to the emperor. Another book, ‘Observations on the Theory and Practice of Landscape Gardening’ by H. Repton esq. 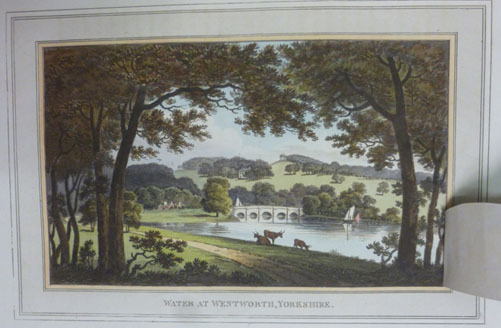 published in 1803 reflects the increasing refinement of Repton’s theories on landscape and architecture. It contains 27 etched and engraved plates, 12 of these with overslips, one folding, and many hand-coloured or tinted, aquatint and engraved illustrations in the text, 2 with overslips. Below we see an example of one of his engraved landscapes using the ‘overslip. Picture 1. Here the overslip is laid flat to show the landscape as it appeared before the implementation of Repton’s architectural idea. And below in picture 2 we see the architectural design in all its splendour with the overslip moved. 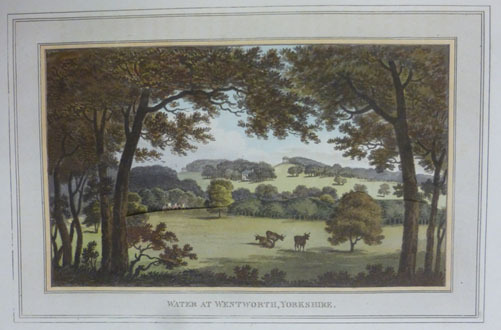 The many similar examples within the book offered the viewer a novel alternative aspect to a scene and provided them with an almost photographically realistic view of how the landscape would look when Repton’s changes were put into practice. We have Parkinson’s ‘Paradisi in sole Paradisus,’ 1629, Gerard’s ‘Herball’ of 1636 and J. De La Quintinye’s ‘Compleat Gard’ner’ of 1693. John Evelyn’s ‘Kalendarium hortense,’ 1699, R. Bradley’s ‘New Improvements of Planting,’ 1718. The list of fascinating works goes on and whatever area of gardening literature interests you the Gott collection will undoubtedly cater for all tastes. 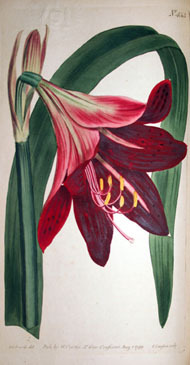 Amaryllis Reginæ or Mexican Lily. On the left we have Amaryllis Reginæ or Mexican Lily. Vols. 13-14, 1799-1800. 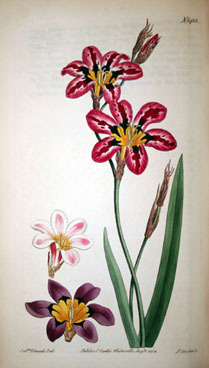 Sparaxis Tricolor or Three Coloured Sparaxis, Vols. 35-36, 1812. ‘Horae beatae Mariae Virginis ‘ or Book of Hours. Believe me, the book is fabulous, but I am afraid you will have to keep watching the secretlibraryleeds blog a little longer before we reveal the rest of the picture and, perhaps, more from the Leeds Central Library illuminated manuscript, ‘Horae beatae Mariae Virginis ‘ or Book of Hours.